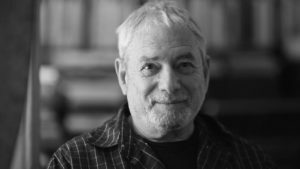 The American poet and writing teacher, Larry Fagin, born and based in New York, died on May 27, 2017, age 79. We were long-time friends, who first met in San Francisco a half-century ago and we both “studied,” or better, hung out, with the poet Jack Spicer. 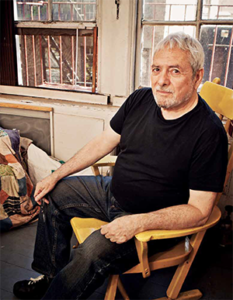 I’m in the foyer of a little apartment building on 12th St., the next day, between 1st Avenue and Avenue A, across the street from a public school, looking through a small square of smoky glass in a reinforced metal door until I see the face of Fagin seeing me. He comes through the door and we hug to make up for the years we haven’t seen each other. Out on the sidewalk, Larry asks, “Plain or fancy?”, I say, “Plain,” and we begin to walk up a few blocks to his neighbourhood coffee shop, where we’ll get coffee and settle in. As we’re walking, I glance over at Larry, unconsciously adjusting the image of him I had from when I last saw him, as one invariably does upon seeing someone after a decades-long hiatus. I always thought of him as a kind of quick bird, a sparrow or maybe a bright-eyed young crow or grackle, with a crow’s rasp of laughter, and now, striding alongside him, even as I’m registering his familiar beak, I begin to notice that he’s bundled up a bit, as have I, against the spring chill, but no, wait, it’s not so much that we’ve bundled up — after all, it isn’t that chill — but that we’re both simply more bulky than long ago, and if we’re still in any way birdlike, we probably look more like pigeons painted by say, Rubens. Plus, since we’re semi-aware of parodying old guys walking along, reminiscing (we’re not really old guys, are we?, but, young at heart, ha-ha), you could say we appear to be Damon Runyonesque, Rubens-like, tattered, plump old birds (have I ever actually read Damon Runyon?). Larry is instantly at home in his neighbourhood coffee shop (which, I begin to gather, is what stands in for the cafés of Berlin, since New York isn’t, I’ve noticed, a café city), greeted by and immediately bantering with the elderly Asian woman who runs the place, the two of them familiarly squawking at each other as we settle into a booth, as coffee and Danish are duly set before us. It takes no more than the mere mention of Berlin (where I now live part-time) or Paris (Larry was there, too, about the same time I first went), to set us off, and Larry is telling me the story -– I had passingly mentioned the poet Gregory Corso, whom I had met in Paris in 1959, which reminds Larry –- of the time he and Greg Corso, along with Larry’s girlfriend of the time, and the actress Jean Seberg had double-dated one evening in Paris. “Jean Seberg!” I say, astonished to hear her name (while at the same time registering that I haven’t heard the term “double-dated” in eons), and Larry cackles, too, as we both consider a night on the town with the gamine-like star of Jean-Luc Godard’s Breathless, her name or image (elfin, cropped blond hair, high cheekbones) now known probably only to film buffs. “And she was in Jeanne d’Arc, wasn’t she?” one or the other of us (probably me) recalls, Otto Preminger’s failed film, “Yes, yes,” her troubled life reprised in a flash within the course of a quick anecdote, right on through to her suicide death years later (when?, late-70s?, age 40). The San Francisco poetry “scene,” c. 1960, in front of City Lights bookstore. 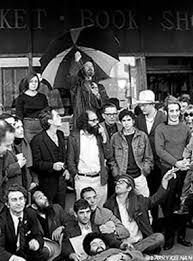 Allen Ginsberg is in the center of the photo; Fagin is seated in the middle of the row at the bottom of the picture. Then we gab away non-stop for the next two hours, until Larry has to go off to meet some students, to whom he teaches writing, private lessons for individual aspiring writers, as well as some writing courses at the legendary New School, and the flow of talk, opinions, reminiscences veers wildly yet smoothly, instant shifts in sub-topics without loss of comprehension, from Paris in the late 1950s, to Language Poetry (no, he reassures me, I don’t have to worry about having missed something in having more or less missed LangPo, as it’s retrospectively known), to the San Francisco poetry scene in which we were mutually engaged in the mid-1960s, to what is it like being an intellectual in New York in 2005 (like, almost, Don’t ask). “And the Muse?” I ask, “is she still alive?” Yes, he reports, knowing immediately to whom I’m referring, and gives me a blow-by-blow account of visiting her, with another poet friend, a couple of years ago, in, good-god, East Oakland, California, still drug-addled, not quite rescuable, yet looking surprisingly great at, what, 60? When we were young, and yes, these two elderly gents in a New York coffee shop on a Monday morning approaching noon were once young and could even “run the table,” as they say, in select San Francisco pool halls, she was the young woman all the straight younger poets in our circle were slightly in love and lust with, one of the last proteges of our dour mentor, Jack Spicer, and the author of a few poems of crystalline purity and beauty. A kind of goddess or muse. Alas, other crystalline substances attracted her attention, and for the long, long interim right up to the latest sighting she was on and off, in and out of the needle-strewn purgatory (how she would snort in derision at that sensationalizing phrase!) of her own and her dealers’ making, but making no more poems. So, that’s the itinerary of the talk, and it’s like stirring up some pond, with smoky clouds of pond bottom rising up through the pond waters and then resettling to the bottom once more. But the main pleasures, above and beyond the particular topics, are as follows. 1) The pleasure of concentration: the locked-in attentiveness and intensity of conversation with Larry, in the midst of the general fragmentation, of travel disorientation, of people constantly chattering on cellphones in public places, of everybody –- waitresses, bus drivers, clerks –- multi-tasking, affording you, however competently, a fraction of their focus. At its most extreme, for example, at the neighbourhood grocery on Spring St., that very morning, where the clerk, mid-20s, “middle-Eastern looking,” as the police profilers would say, talks on a cellphone (in a middle-Eastern language) through the entire transaction, so that I don’t get one instant of his direct perception, and as I’m leaving an elderly Asian woman holding a can of beans says to him, “Bean,” or an approximation of it, and he says, “Beans. What kind of beans?” (an utterance way beyond her capabilities in what’s known these days as “global English”), disappearing among the shelves with her, all the while uninterruptedly yakking away into his cellphone. Whereas, in talking to Larry, it’s like a two-man luge team swerving down the icy chute. 2) The pleasure of coherence: to find that after all these years, the old friend, now in his late-60s, is completely and utterly in possession of his faculties (notwithstanding the title of Paul Simon’s song, “Still Crazy After All These Years”), totally sane, engaged, witty, the works. I mean, there’s no way of knowing in advance, it could be dope, off-the-wall obsessions, fetishes, that old “I’ve seen the best minds of my generation destroyed by . . .” etc. “The prose poem?” I say. “What a coincidence! That’s just what’s on my mind right now.” At which invitation, Larry provides me a little precis on the subject, and, as always, much of it is news to me. Sure, I know something about it –- Baudelaire, Rimbaud, an American 20th century tradition from Gertrude Stein’s Tender Buttons to John Ashbery’s Three Poems, and Jack Spicer’s Heads of the Town Up to the Aether, as well as other prose poem writers in other languages, the most important of whom for me is the recently deceased Polish poet Czeslaw Milosz and his late book, written in his 80s, Road-side Dog. Yet even though there are great prose poems (usually by writers who generally write poetry-poems), it’s nonetheless an unstable, self-deprecating form, seemingly for people who can’t really write in poetry lines, and have to forego the real poem’s armada of multiple storytelling through enjambment, metre, rhyme, and the rest, retaining maybe only some semblance of the breath and the poetic principle. It’s a hybrid, a decayed neither this nor that form, such that even now, every discussion of it begins, So what exactly is a “prose poem”?, a question to which there’s no satisfactory answer. How to distinguish it from the scrap, note to oneself, aphorism, vignette, sketch, essayette, journal writing, or shaggy dog story? Not possible. “But you write prose poems,” Larry recalls. “You wrote ‘Topic Sentence,’” he says, citing a piece of writing I wrote around 1970, a piece about learning to write composition at school and how the writing itself subverts not only all the rules of composition but one’s entire being, and which, again quite coincidentally, is a piece of writing I’d just been revising in the last month, although I’m not sure I’d ever thought of it as a prose poem. “That’s a prose poem,” he declares, like the guy at passport control putting the stamp of arrival in your passport. Bang!